New book by Gates calls Netanyahu 'ungrateful' for not appreciating all that President Obama's administration has done for Israel. 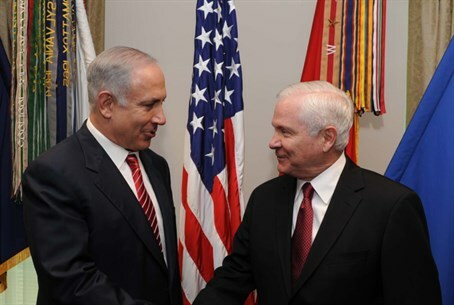 Former US Defense Secretary Robert Gates has revealed in his new book, "Duty: Memoirs of a Secretary at War," that over 20 years ago when he first met Prime Minister Binyamin Netanyahu he formed a negative impression of him. In a quotation from the new book, which appeared in Yedioth Aharonoth on Wednesday, Gates writes that as Deputy National Security Adviser to former President George Bush the father, he felt Netanyahu was "superficial" and "arrogant." Netanyahu was Israel's Deputy Foreign Minister at the time. "I was offended by (Netanyahu's) superficiality and his criticism of American policy, beyond his arrogance and incessant ambitiousness," reveals Gates. "I told National Security Adviser Brent Scowcroft that it would be better if (Netanyahu) wasn't allowed to come back to the White House." The book highlights the tensions underlying relations between the US and Israel, and is particularly timely given the contentious peace talks that US Secretary of State John Kerry has reportedly been pushing forward with the threat of European boycotts on Israel. Concurrently, Israel has been growing ever closer to China. As Defense Secretary under President George W. Bush, Gates' relations with then newly appointed Prime Minister Netanyahu did not improve. Gates further writes that Netanyahu is "ungrateful," not appreciating all that President Barack Obama's administration "has done for Israel." Gates writes, for example, that in a meeting Netanyahu asked him how the US intends "to compensate Israel" for a massive arms deal between the US and Saudi Arabia. "Exasperated, I shot back that no US administration had done more, in concrete ways, for Israel’s strategic defense than Obama’s," claimed Gates. Iranian reports on the incident in Gates' book, noting that in 2010, as the United States was completing the $60 billion arms sale to Saudi Arabia, the Israelis received an additional squadron of 20 F-35 jets as a condition for publicly supporting the deal. Gates notes that he preferred former Prime Minister Ehud Barak, who others have called "dangerous," to Netanyahu, claiming Barak "did much to strengthen the IDF." "As a friend and supporter of Israel, I believe that Jerusalem needs to think about its strategic environment," wrote Gates. "Doing so will require it to open stronger relations with non-allied governments, that share its concerns in the regions - including the concerns on Iran, amid the rising influence of Islamists in the 'Arab Spring' and birth rates of the Palestinians, which are higher than those of Israeli Jews. Time isn't on Israel's side." Netanyahu's office responded by saying the book refers to "things, some of which concern a period of over 25 years ago. At that time, Binyamin Netanyahu already stood for the essential security interests of Israel and he continues to do so currently." It is worth noting that reports indicate Netanyahu was willing to lease the communities of Judea and Samaria, handing official ownership of Israel's heartland to the Palestinian Authority (PA) in the framework of peace talks. The offer was refused by the PA.